A few weeks ago I visited Tre at the shop and he shared some exciting news. He was packing up and headed out to Colorado Springs to embark on an intensive 5 day clinic to receive his USA Cycling Mechanic's License. 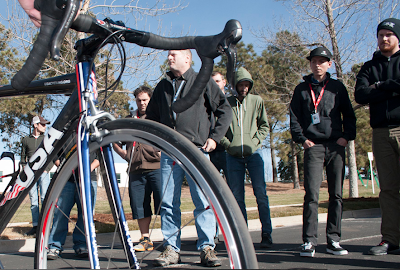 As one of a select 60 people, Tre spent the week in both lectures and workshops covering a range of topics including bicycle material construction and design, race support techniques, as well as career and program development. The group took a field trip and toured the 7-Eleven U.S. Olympic Training Center Velodrome which Tre was quite excited about. Tre has already invested quite a few years in to his maintenance career and is an exemplary model for what Life Long Learning is all about. He's makes it a priority and it is evident through both his passion and actions for pursuing and leveraging opportunities and experiences to enhance his skill set. I've told him before that I would only let the best mechanic press in my bottom brackets but I didn't think he would really go through all this trouble. Congratulations Tre, this is definitely an achievement worth celebrating.